Stewart Butterfield (BA 1996) has gone on to found Slack and Flickr. 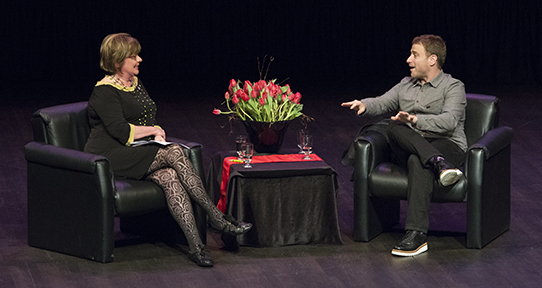 He received a Distinguished Alumni award in 2008 and is seen here in conversation with Shelagh Rogers as part of Alumni Week 2015. The special attention in philosophy to reasoning, good argumentation, logic, conceptual analysis, and clarity and precision in communicating ideas develops skills that are of enormous value to students both as participants in the economy and as active citizens and community members. A degree in philosophy is an excellent preparation for further studies—our alumni have pursued degrees in law, education and business. Additional education and training may be required. What can you do with a Masters in Philosophy? "Cakewalk to Exams" event today at 2:30 in the Lounge! Come get cake and celebrate our soon-to-be graduates. Colloquium Friday! Title: “Bittersweet Food” Friday, March 29th, 2019 at 2:30pm Location: Clearihue A303 Dr. Shen-Yi Liao, Associate Professor of Philosophy, University of Puget Sound Abstract: Nostalgia and food are two (near-) universal aspects of the human experience. In nearly every language, one can find a word that corresponds to the English word 'nostalgia' that tracks the idea of a backward-looking longing. And, of course, cuisine is a central force in formation of a cultural—and sometimes, personal—identity. This paper explores the intersection of these two aspects of human experience so that we can learn more about each. The primary goal of this paper is to use contemporary cognitive science to understand experiences with nostalgic food. The secondary goal of this paper is to use nostalgic food to defend the artistic status of food.